A café in Helsinki, right in the middle of Pyhä Birgitta Park, is designed to be dynamic in every way: it has no front or back and big windows allow you to see right through it. A 100% sustainable project. 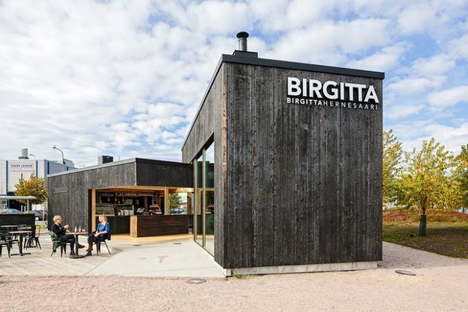 Finnish architecture and design studio Talli built Birgitta Café right in the middle of a big open space in the park of the same name, meaning that the building has to assert its role and be active in every direction and from every point of view. The spiral-shaped building has no front or back, and is transparent and accessible from different directions. The main material is wood, which covers the interiors and the patio and frames the sliding windows, which can be used to open and close the indoor spaces and unite them spatially and visually with the outdoors. As the building is only open in certain months of the year, its insulation and ventilation are reduced to a minimum and are therefore very ecological. The wood used in the project comes from Honkarakenne in Finland, doing away with the pollution and cost of transport in this 100% sustainable project.